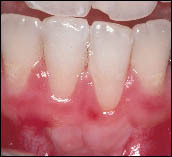 The free gingival graft is a periodontal procedure, which can prevent progressive gum recession. The gum tissue is carefully taken from the roof of the mouth and is transplanted to the tooth that has had gum recession. 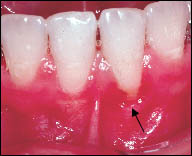 Root coverage is more difficult to achieve in this procedure as compared to the connective tissue graft due to differences in blood supply. However, a creeping attachment can occur which eventually covers the root surface. The following case illustrates the healing potential of such a graft.